Sometimes we want to arrange a trip for someone with a serious mobility challenge. We recently did just that for a family member who was temporarily unable to walk any great distance. The trip started and ended in northern California and encompassed a number of important scenic areas in California, Nevada, Utah, Colorado, New Mexico, and Arizona. We traveled by automobile the entire way and were severely limited on time. We wanted to pack in the maximum punch in the shortest time. If you are contemplating this kind of thing and have the luxury of time we strongly recommend that you take longer for the trip, particularly if a wheelchair is involved. The important thing to realize is that these kinds of trips are possible even if your guest has physical limitations. The message is that you have to be careful, but you should not let a mobility challenge confine someone unnecessarily. We started out in Petaluma, California with breakfast at Hallies. A small out-of-the-way restaurant with the best frittata in all of California. After breakfast we wound our way through the maze of freeways surrounding San Francisco and headed east on Interstate 80. This very scenic highway roughly follows the route that many early pioneers used to cross the Sierra Mountain range into California during the middle of the nineteenth century. We passed Donner Lake and the memorial to the Donner Party and continued on to Reno where we spent the night. Unfortunately our favorite restaurant was closed that night and we had to settle for a second best that is not worth mention. The next morning after coffee we headed out again on Interstate 80 this time driving all of the way to Salt Lake City, with a stop in Winnemucca for an adequate breakfast. This part of the trip has very little of spectacular interest and requires a book on tape or a good conversation to keep up the morale. There were three of us in the car and we had not seen each other for quite a while so good conversation flowed easily and the long drive passed quickly. A very pleasant surprise for us was discovering the newly opened California Historical Trail Interpretive Center a few miles west of Elko. Even though they are still putting up their displays it is well worth a visit. The salt flats in Utah were new to our guest and that helped too. That evening we splurged with a hotel room in the center of the city so that we could easily visit the beautiful Mormon Temple complex in the evening. An early dinner was in one of the several beer pubs a few blocks away. Good beer and excellent pub food. The culinary aspect of the trip was definitely on the upswing. The next morning we got an early start and headed south on Interstate 15 where we caught an adequate breakfast in one of the chain egg places before turning southwest on Highway 6 through the Wasatch Mountains. We were happy to see that our guest was delighted with Price Canyon's mesas and the antelope along the way. At Green River we turned east onto Interstate 70 and cranked the speed up a bit. Because of our early start and Interstate speed limits we were able to fit in a brief surprise side trip to Arches National Park before returning to the Interstate and our eastward progression. 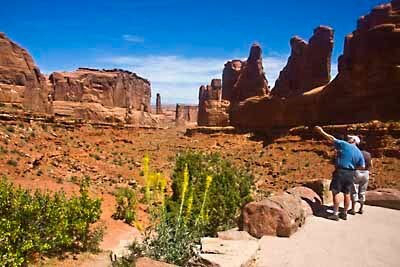 Our guest was suitably impressed by Arches even though we could not include more than a few short walks at some of the view points. The road system is laid out in such a way that a great deal of the park can be enjoyed from the car. After Arches the scenery changed gradually from mesas to mountains with the crescendo of Summit County's snow covered peaks just before turning into Breckenridge. That evening we stayed at a condo in Breckenridge and dined on an adequate pizza accompanied by a superb local ale. While in Breckenridge we visited with friends, dined well in local restaurants and relaxed for a couple of days before heading out again. This time we were heading south on Highway 6 driving down the spine of the Rocky Mountains. At Fairplay we joined Highway 285 and continued South to Highway 17. We stopped at the Great Sand Dunes National Park and Preserve to show our guest a few rather magnificent sand dunes and some mule deer bucks with velvet antlers (along with a multitude of campers). The dunes are impressive from the car, but of limited value on this kind of a trip because you can not get out into them. At the same time they are directly on the route that we were taking and therefore worth the stop. After the dunes we turned west on Highway 160 crossing the continental divide by way of historic Wolf Creek Pass. 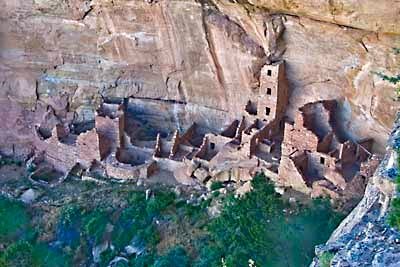 Native Americans, Spanish explorers, prospectors and settlers used this important route long before the tourists and the resultant legends are numerous and interesting. If you come this way you should pause for a moment and learn a bit about this beautiful corner of our world. After crossing into the geographic west we headed for Durango and an excellent light southwestern dinner at the Steamworks Brewpub. (I particularly appreciate their Lizard Head Red.) After dinner we drove to Mesa Verde where we were lucky enough to have reservations at the Far View Lodge. After lining up our beds, we drove to Bloomfield and then turned south on Highway 44 about forty miles to an almost unmarked turnoff to the right just past the very small community of Nageezi. (Sometimes there is a sign and sometimes there is not, but there is a more durable small gas station/store on the left side of the road that has managed to be there for all of the years that I have been visiting this area.) 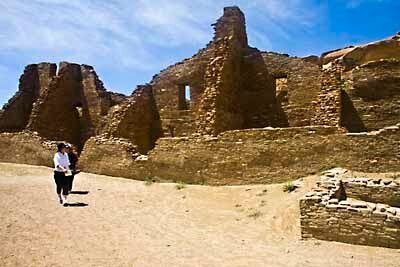 We turned right and wandered along the very washboarded, dusty, unpaved road for about sixty miles to Chaco Canyon. We drove through the entire complex and then walked into the great courtyard of Pueblo Bonito. 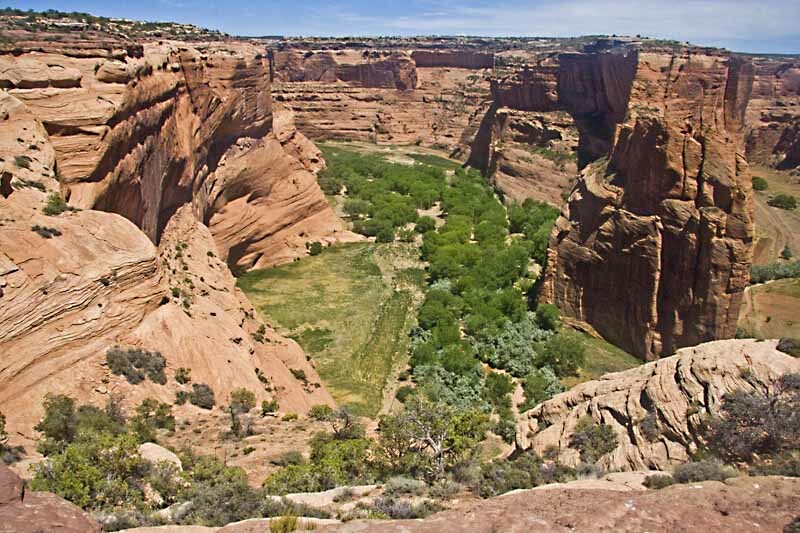 The western United States has many treasures and it is obviously difficult to pick favorites, but he who does not include Chaco on the short list has a defective rating system. After Chaco we headed back to Farmnington and dinner in a small steakhouse with very good steaks and superb service. After a very good breakfast at the hotel (customized omlettes cooked to order) we headed west out of Farmington on Highway 64 to Shiprock (talking all the while about Tony Hillerman novels). 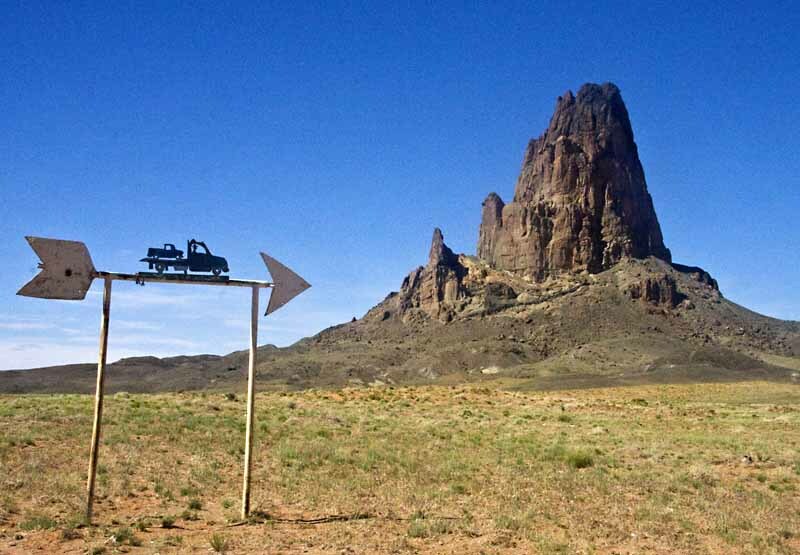 At Shiprock we turned south on Highway 491 (old 666) to Sheep Springs (still talking about Hillerman). There we turned southwest on Highway 134 and then, after a few miles, northwest on Highway 12 to the overlooks on the northern side of Canyon de Chelly. 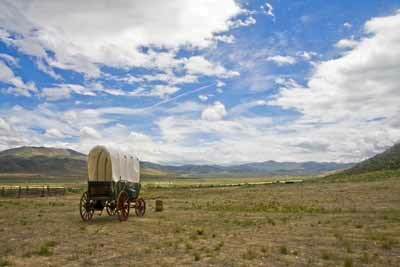 The weather had been magnificent all through the trip and our good fortune continued here at the canyon. This is another one of those magnificent natural phenomena common to the American West that is overlayed with centuries of history, tradition and legend. We were not able to get down into the valley, but we did manage to make a few walks that gave our guest an idea of what the place was all about. We also managed to buy a few jewelery items and a fabulous rock painting by Yazi, an artist and jeweler that has been making his family's living for twenty-five years by selling his art. (Something that manages to elude many of our artist friends in the main stream culture.) After the Canyon, we drove through Chinle and turned north on Highway 191 a few miles to Highway 59 where we turned northwest to Kayenta.